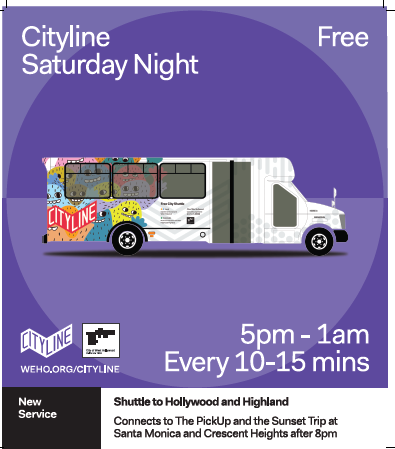 The City of West Hollywood’s free Cityline service has expanded Saturday service to better connect with the Metro Red Line at Hollywood and Highland. The Cityline “Commuter” service, which runs on weekdays during morning and evening commute hours, is now available on Saturday evenings from 5 p.m. to 8 p.m. It runs the full length of Santa Monica Boulevard with regular stops between Robertson Boulevard and La Brea Avenue. The Cityline “Shortline” service offers a new night route and is now available on Saturday nights from 8 p.m. to 1 a.m. With arrivals every 10 to 12 minutes, Shortline service operates between Hollywood and Highland, connecting to the Metro Red Line, and the corner of Santa Monica and Crescent Heights Boulevards. Cityline Commuter and Shortline maps are available online. Riders who use Cityline Shortline to come into West Hollywood can choose to walk to their West Hollywood destination from Crescent Heights and Santa Monica or transfer to one of the City’s free trolley services: The Pickup, which runs on Santa Monica Boulevard, or The Sunset Trip which runs along the Sunset Strip and connects to Melrose and Santa Monica Boulevard at specific stops.